Radical right-wing populist parties, such as Geert Wilders’ Party for Freedom, Marine Le Pen’s National Front or Nigel Farage’s UKIP, are becoming increasingly influential in Western European democracies. Their electoral support is growing, their impact on policy-making is substantial, and in recent years several radical right-wing populist parties have assumed office or supported minority governments. Are these developments the cause and/or consequence of the mainstreaming of radical right-wing populist parties? Have radical right-wing populist parties expanded their issue profiles, moderated their policy positions, toned down their anti-establishment rhetoric and shed their extreme right reputations to attract more voters and/or become coalition partners? This timely book answers these questions on the basis of both comparative research and a wide range of case studies, covering Austria, Belgium, Denmark, Finland, France, the Netherlands, Norway, Switzerland, and the United Kingdom. 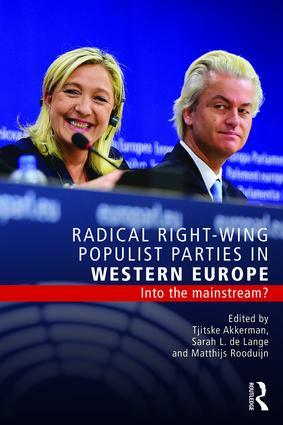 Analysing the extent to which radical right-wing populist parties have become part of mainstream politics, as well as the factors and conditions which facilitate this trend, this book is essential reading for students and scholars working in European politics, in addition to anyone interested in party politics and current affairs more generally.